This PDF 1.5 document has been generated by Adobe InDesign CS5.5 (7.5) / Adobe PDF Library 9.9, and has been sent on pdf-archive.com on 18/12/2016 at 10:27, from IP address 213.135.x.x. The current document download page has been viewed 155 times. File size: 669 KB (8 pages). Amy Gilliam, MD and Anita Gilliam, MD, Ph.D.
you’ll learn the answers to your social media questions and how to safely engage with patients using online social media tools. dermatology cases of clinical indecision. We will discuss example cases to demonstrate how to analyze cases and discuss the role of key ethical principles (e.g. quality of life, and context) and demonstrate how working through these categories and principles can offer assistance at times of clinical ambiguity. practical information provided to the individual physician on: securing a job, asking the right questions when interviewing or changing practice settings, expectations for practice management, or promoting oneself on a desired career track. self-assessment questions they must complete every three (3) years in MOC. Meeting. A minimum of 25 people will be required to hold this session. review and selection to be presented during SPD’s 38th Annual Meeting. 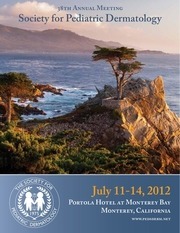 Submission deadline is May 18, 2012.
of the year to first review the examples posted online at www.pedsderm. net/sections/casepresentations.php. The “template” cases will help to provide guidelines for preparing a submission. field. Three (3) abstracts will be selected for oral presentation during the plenary session of the meeting. Original basic science or clinical research projects are eligible for consideration. which have been conceived and/or conducted by pediatric dermatology fellows and/or junior faculty who have been out of training for 5 years or less. Limited to 40 posters. Awards will be presented for the best posters. Dimensions of the poster are not to exceed 4’ x 6’. No cost to attend — pre-registration is required. enjoying cocktails, hors d’oeuvres and entertainment. Badges will be required for entry. the first 45 people who register. you with the perfect excuse to stop and catch your breath! the first 100 people who register. the first 50 people who register. can also see the emerald fairways of The Links at Spanish Bay, Spyglass Hill and the world-renowned Pebble Beach Golf Links. one of the town’s stone-paved alleyways or curlicue-roofed shops. Portola Hotel &amp; Spa at 2:30 pm and 3:30 pm with return trips scheduled for 4:15 pm and 5:15 pm. the first 90 people who register. a host of other fishes. Credit(s) and may be used toward the American Academy of Dermatology’s Continuing Medical Education Award. a room with another attendee (and split the cost of the room). Please indicate whether you are male or female and your anticipated arrival and departure dates. (888) 222-5851 or (831) 649-4511 or online at www.pedsderm. so make your reservations early. relevant conflict of interest during discussion of a given topic. Self-Parking is $17 daily with in and out privileges. Valet Parking is $20 daily with in and out privileges. Monterey Peninsula Airport is approximately $7-$10 one-way. a one and a half hour drive down the California coast. do not qualify for resident rate for the Aquarium event on July 13. **Payable to Society for Pediatric Dermatology or SPD. All checks must be made in U.S. dollars, drawn on U.S. Banks. This file has been shared by a user of PDF Archive. Document ID: 00523618.